Is that a Braun ET44 in Your iPhone? When you look at the Braun products by Dieter Rams—many of them at New York's MoMA—and compare them to Ive's work at Apple, you can clearly see the similarities in their philosophies way beyond the sparse use of color, the selection of materials and how the products are shaped around the function with no artificial design, keeping the design "honest." Ive's inspiration on Rams' design principles goes beyond the philosophy and gets straight into a direct homage to real products created decades ago. Amazing pieces of industrial design that still today remain fresh, true classics that have survived the test of time. The similarities between products from Braun and Apple are sometimes uncanny, others more subtle, but there's always a common root that provides the new Apple objects not only with a beautiful simplicity but also with a close familiarity. Braun Atelier TV and latest iMac 24. Braun T1000 radio and PowerMac G5/Mac Pro. Detail of the radio perforated aluminum surface. Braun T3 pocket radio and Apple iPod. Braun L60 sound system and Apple iPod Hi-Fi. Braun LE1 speaker and Apple iMac. Some people will probably call these examples a "rip-off" but, in a world where industrial design and art are constantly being recycled into new work, I just see Apple's products as a great evolution to classic concepts. 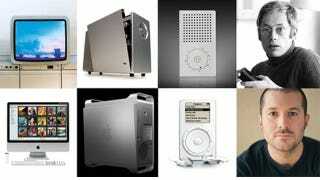 Now, as I look at Rams' work I can't help but to wonder: which of these old Braun designs will Apple revive next? Is there a MacBook Air—the rumored ultra-slim wire-free portable that seems to be the favorite bet for tomorrow's keynote—in there?